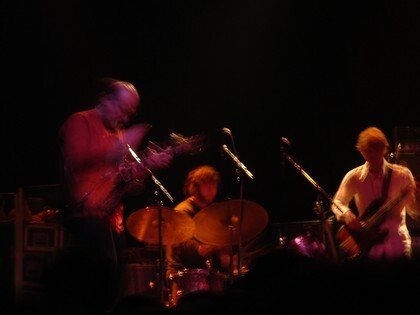 I dig Medeski Scofield Martin & Wood, precisely because this is NOT MMW — if you are looking for MMW, seek out some MMW! This is MSMW. When I first heard A Go Go back in ’98, I was already a fairly big MMW fan and had been listening for a few years. I really liked how seamlessly they became Scofield’s band — how it sounded like the trio even though it didn’t (so there’s a minor amendment to my opening lines above — I still feel the trio in there, for sure, but the intent is different). However, this time around, the naming of MSMW is appropriate because Sco becomes more a part of the band rather than simply playing with a different rhythm section. The entire band is more integral to many of the songs, which is also interesting because a number of the tunes worked rather well live WITHOUT Sco when MMW played them in late ’05 and early ’06. I am a fan of the MSMW sound and I love following a progression or evolution of a sound, which has been fun with these guys. The latest gigs from 2013 with Sco were more adventuresome than ever. On this Fall 2006 tour the band plays with their new sound, giving different treatments to tunes and exploring the spontaneous through those Down The Tubes improvisations, both with success and not so much, but the spirit of the exploration is what I remember loving, and each is worth that journey for various reasons.